WA External Solutions are roof restoration experts, so if your tiled roof is looking tired and needs a lift then call the friendly team for an obligation free quote. We deal with all levels of roof restoration, so if you only need a wash and re point, changing broken tiles, fixing roof leaks then call 1300 660 978 now for one of our friendly team to come and visit. 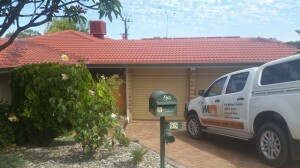 Not only Manjimup, but bridgetown and all of the south west WA for roof restoration and roof painting. Roof Restorations come with a seven 7 year warranty which gives you peace of mind.